This page has tips and advice on how to take care of your lymphoedema when you are on holiday or out in the sun. 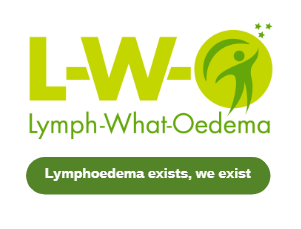 Living with lymphoedema you might find your affected limb(s) swell more in the summer months or when on holiday because of the heat, don't get too upset by this, when you get back home the swelling should go down.. Being away from home, travelling by various modes of transport can be a challenge and could influence your lymphoedema swelling. As much you can stick to your skin-care routine and please wear your compression. Increased swelling, prickly heat, hives, insect bites, and stings are far more likely to happen in the summer or on holiday. Even a change in the water you use when you shower or maybe spend more time in the pool or sea. Please remember after swimming to shower as both the chlorine and salt water can dry your skin. 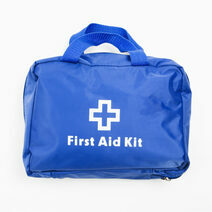 See our First Aid Kit on this page for items to pack. Sun holidays with high temperatures could cause problems, for your lymphoedema. If you have had radiotherapy be very careful not to burn the affected area of your skin as it will stay sensitive to the sun even when your treatment has finished. Keeping cool in the summer or when on holiday can become a nightmare, it is very important to try and keep the affected area of your lymphoedema cool. Even if salty foods don't normally affect your swelling, this may be more likely in the summer. 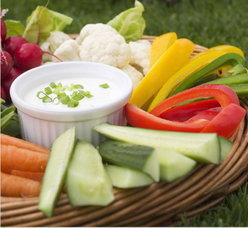 Go for crunchy snacks like fresh raw vegetables instead of potato chips. 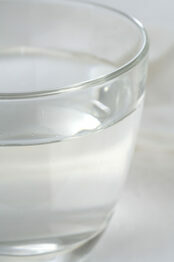 It is important for those living with lymphoedema to drink more water. Don't be tempted to think the opposite. Lymph fluid is high in protein, to remove the protein from your tissues you need to drink water. Drinking water means the 'protein traffic' moves better around the lymph system. At home or on holiday, this tip I learnt living in Cape Town a few years ago, the benefits of keeping curtains closed. When you go out, close all your curtains, blinds, shutters so that when you arrive back at home, or to your hotel room, you are stepping into a nice cool room and not into a greenhouse. This applies to all rooms facing the sun. Keep a top or bottoms in a plastic bag in a refrigerator then if you are hot and bothered you have clothing to change into that is nice and cool. Keep flannels in the freezer, then when you go out put them in a plastic bag to use on your face, neck hands or anywhere when you want a quick cool down. Keep water in the fridge for a nice cool drink. Another way to keep cool indoors and outdoors is one of these pocket fans. Available in the summer months in some supermarkets. Outdoors in the summer can pose more problems than overheating. 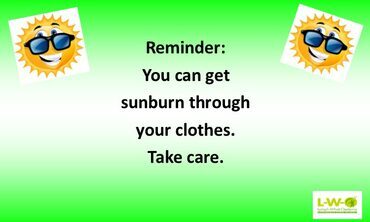 Sunburn, prickly heat rashes, insect bites and stings are also potential problems. No matter which repellent you use, some insect bites probably are inevitable. Be prepared to treat them immediately to lessen the histamine affect, which can cause increased swelling in that area. Treat an insect bite like any break in the skin on your limb at risk. Wash and dry area completely and apply antiseptic cream to area. 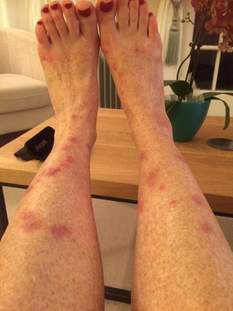 The photograph shows the misery insect bites can cause. If you are going on holiday remember to include alcohol wipes to clean off any skin break, antiseptic cream for application on the skin. If you have had an episode of cellulitis in the past it is recommended you include antibiotics in your first-aid kit so that you can start taking them without delay if your limb should become infected (hot, red, swollen and or painful) while you are away from home. Always wear your compression garment whilst travelling and for several hours after. For all of us that have lymphoedema it is important to remember to keep moving. 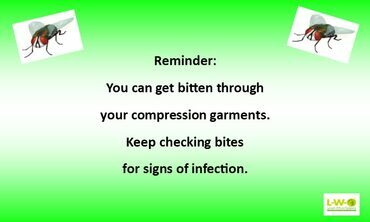 Please remember you can get bitten even with a compression garment on. If you do get hot, cool yourself with lukewarm showers or baths, this works better than very cold water. If you're hot, but it's not possible to get into a shower or bath, at least cool off your affected limb by wrapping a cold wet towel around it and elevating the limb with support. Some people prefer to cool off by dampening the garment itself. If you do this, be sure that the garment dries in a reasonable amount of time so that there is no chafing of the skin, especially at joint creases. 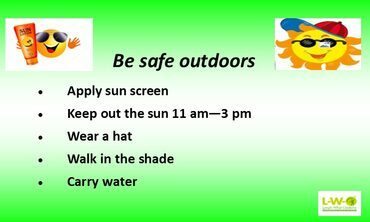 Avoid the sun between 11 a.m. and 3 p.m. Clothing during hot weather should be comfortable and light, if you do start to swell then even your underwear can become extremely uncomfortable. Moreover, looser, non-restrictive clothing will allow more air circulation so that perspiration and moisture won't be trapped next to your body. Cotton absorbs perspiration while synthetic materials trap the heat. Remember, you can also get sunburnt through clothes. Always apply sun screen to exposed parts of your skin. If you have breast, chest wall or under arm lymphoedema bras and sleeves can be become very tight. Wear light, loose, non-constricting clothing. Not only will it be cooler; it is also better for the free flow of your lymphatic system. There is a tendency of lymphedematous limbs to swell more in the summer; clothes and underwear that fit well in the winter may be too tight for summer wear. If you have lower limb lymphoedema, wear well-fitting footwear which provides good support. When travelling do not remove your shoes because swelling could increase and then you might not get your shoes back on. When the weather turns hot make sure you are not putting yourself at risk from blisters, tightness, or redness from new footwear. Wear footwear that can breathe. 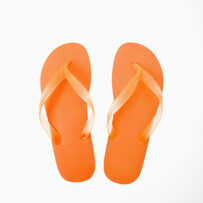 Around pools, in the sea or even in showers when on holiday you should wear something on your feet. This will protect you from fungal infections, or stepping on something sharp. A minute slither of glass that the eye can't see can cause a serious injury or infection. Everyone with lymphoedema should protect their feet. At night, sleep in cotton, cotton nightwear, sheets, pillow cases and cotton duvet covers. Check each day to be sure the edges of your clothing do not leave indentations in your skin. Do not wear the item if it leaves indentations - it can constrict some of your delicate superficial lymphatic system. 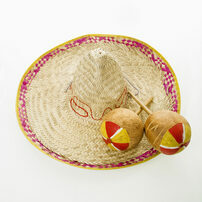 Wear a wide brimmed hat that offers shade. 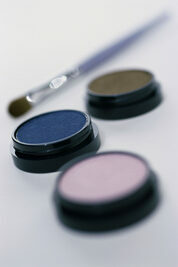 Make up in hot weather prevents your skin from breathing. In really hot weather I either go without or just use eye makeup or lipstick. Do not wear tight belts. Make sure that your jewellery is not tight. Make sure that bracelets, rings and watches do not leave indentations or cause swelling. Rings can be a big problem and they can cause swelling. This makes them difficult to remove. Make sure you have enough medication before you go away. Know the Generic name for your medication. In light of events in 2016, please check if your medication is legal when travelling outside the UK. If you are prone to cellulitis, then visit your GP prior to your holiday to get antibiotics. Lymphoedema clinics might be able to provide you with a standard letter requesting antibiotics. I know some GP’s are reluctant to give out ‘just in case’ antibiotics however the financial argument is that a hospital admission is costlier than an emergency supply of antibiotics. The medical argument is that nipped in the bud cellulitis is easier to treat and the Patient is less likely to suffer damage to whatever Lymphatics are working. In case of emergency. Please make sure you have ICE (in case of emergency) on your mobile phone. Did you know? That there is also a place to add a note; Mine reads; Lymphoedema no invasive procedures to right arm. No BP/Blood tests to right arm. No injections or IVS to right arm. This is available free through Play Store. Google translate is also available through App store or Apple is also free. Our Facebook member's tips have been great and appreciated so here are a few you might like to try. Vitamin B1 has been suggested as an insect repellent. Taking B1 before going on holiday and whilst away might prevent you getting bitten. Spray hats or scarves with insect repellent or citronella which smells nicer. Citronella candles keep bugs at bay. Please remember that L-W-O does not accept responsibility or liability for these tips. Always consult your own Health Care Professional. Relax and keep those legs elevated. At the beginning of this article I wrote about the swelling that lymphoedema patients can experience on holiday or at home in the garden in hot conditions. Below is a photograph supplied by Mary Eaves on how to stay cool and elevate those legs. For UK residents we have useful advice on passports, medication abroad, how to contact the Foreign and Commonwealth Office.